Fidelity is one the most well known mutual fund and brokerage. It also has one of the largest sector equity funds. One of the best rated technology sector equity funds is Fidelity Select IT Services. The fund's review can be found below. The Fidelity Select IT Services fun is seeking to provide capital appreciation. 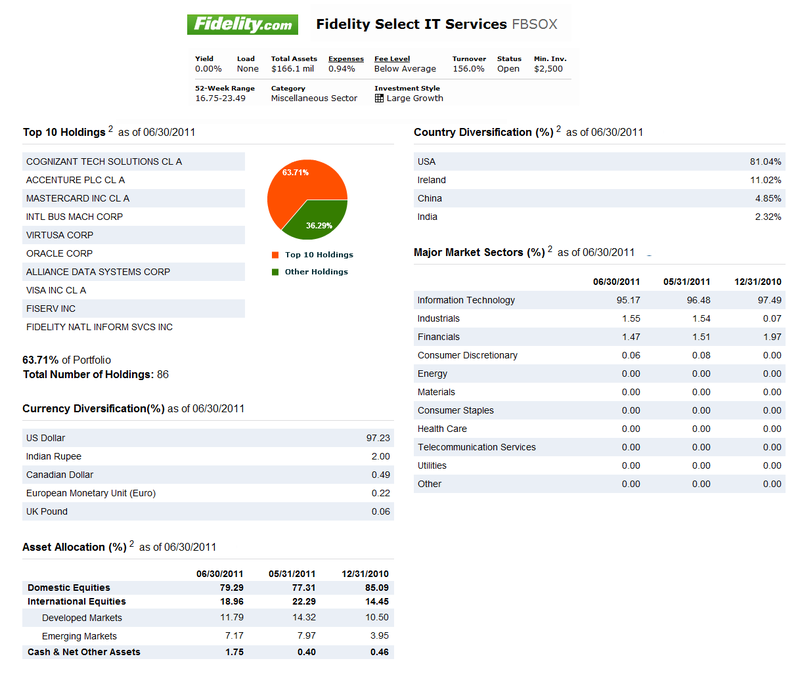 This Fidelity sector equity fund invests mainly in information technology services companies’ common stocks (>80% assets). The fund may invest in securities of foreign issuers. It uses fundamental analysis of factors such as each issuer's financial condition and industry position, as well as market and economic conditions to select investments. The top rated fund is non-diversified equity mutual fund. As typical Fidelity fund, this Fidelity Select IT Services also has a low expense ratio. This fund only has 0.94% annual expense ratio. The fund’s lead manager is Kyle Weaver since 2009. This Fidelity stock fund doesn’t have any sales load fee. The fund total net assets are $166 million as of June 2011. There is also no yield. The fund has received four stars rating from Morningstar. This best rated stock fund has returned 40.40% over the past year and 7.54% over the past decade. The fund has its best performance year in 2009 with 59.05%. Its worst performance return occurred in 2008 with -32.91%. This best sector fund is also featured in the US News magazine as the best miscellaneous sector fund. Investors will need $2,500 minimum balance to invest in this fund in the regular brokerage account and $500 for retirement account (IRA). This top rated equity sector fund is available to many investors. Investors can buy this fund through 62 brokerages. The turnover rate of this fund as of February 2011 is 156%. The assets allocation of this Fidelity fund as of June 2011 is 79.29% in Domestic Equities, 18.96% in International Equities and 1.75% in Cash & Net Other Assets. The major market sectors of this fund are Information Technology (95.17%), Industrials (1.55%), Financials (1.47%) and Consumer Discretionary (0.06%). As of June 2011, this FBSOX fund has 86 holdings. The top 10 stocks in this fund's assets make up to 63.71% of total portfolio. They are Cognizant Tech Solutions Class A, Accenture Plc Class A, Mastercard Inc Class A, International Bus Mach Corp, Virtusa Corp, Oracle Corp, Alliance Data Systems Corp, Visa Inc Class A, Fiserv Inc and Fidelity National Inform Services Inc.